So far, 24 of Seattle’s 30 official ‘visits’ have been made public (either by the players themselves or via various reports). Seven off-site workouts have also been revealed. Ran a 4.40 forty at 6-0 and 207lbs. Despite that speed, he isn’t a natural rangy free safety. He does his best work up at the line like his brother. It doesn’t mean he can’t develop into a viable single-high option but there’s not a lot of that on tape. High character, strong personality. If the Seahawks end up trading Earl Thomas they might consider Reid or Wake Forest’s Jesse Bates III with an early pick. Likely range: Could easily go in the 20’s based on bloodlines and speed. Worst-case scenario is probably early round two. Only ran a 4.58 at his Pro-day at 6-2 and 207lbs. Does possess a +80 inch wingspan though and had decent explosive testing numbers at the combine (34 vertical, 10-0 broad). His hit on Kerryon Johnson in the Iron Bowl potentially changed the course of the SEC in 2017. Very much a strong safety. With a potential Earl Thomas trade in the pipeline, it’s no surprise the Seahawks are looking at the available options. Likely range: It won’t be a shock if he sneaks into the late first round but a safe projection is round two. Classic EDGE type and when he’s healthy and on it, Turay looks the part. He had a terrific Senior Bowl and ended the practise week as a big winner. Didn’t complete all the drills at the combine due to a hamstring injury. Didn’t do anything other than the bench at pro-day. Ran a 1.62 10-yard split at 253lbs. It’s not the ideal 1.5 but he was hampered by that hamstring issue. Comparisons to Yannick Ngakoue aren’t without merit. Likely range: He’s a day two pick, possibly round three but could land somewhere in round two due to the weak pass rush options this year. A stud. Pure and simple. As we highlighted a month ago, Vander Esch compares physically to all of the top linebackers in the league. He’s one of the top 15-20 players in the draft. Explosive, instinctive, intense and quick. He doesn’t get the same hype as Roquan Smith or Tremaine Edmunds but he might have a better career. LVE could play SAM in year one and eventually replace K.J. Wright at the WILL. He’s similar to Isaiah Wynn. They both played left tackle in college, they’re both expected to kick inside to guard. Yet neither got beat very often at tackle. Wynn and Corbett played better than Kolton Miller in 2017. Miller will be drafted first purely because he projects to tackle. We wrote about Corbett in depth here. Like Wynn, he’s a stone-cold stud. One of my five favourite players in the class. Likely range: He’s so good it won’t be a shock if he goes late first round. If he’s there in round two — it’s a steal. 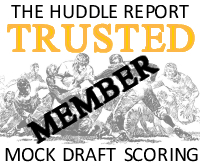 If draft grades were given out for physical measurements and testing, Sweat would be a top-five lock. He has everything — a 1.55 10-yard split, 34.5 inch arms, a 4.53 forty, a near 40 inch vertical and a 4.28 short shuttle. Quickness, length, explosive traits. Injury history (knee) and a tendency to be late off the snap are the negatives but there’s a lot to work with here. Mature, high-character player. Would be a LEO/EDGE in Seattle. Likely range: It’ll depend on how willing teams are to take a chance on his health and how desperate they are to get a pass rusher given the limited options. Top-45 isn’t out of the question. Some will view him as arguably the best defensive tackle in the draft (he’s certainly the best interior pass rusher). Others won’t like the scheme fit. Hurst is dynamite as a one-gap penetrative force. Physically though nothing stands out. His frame (6-1, 292lbs) and length (32 inch arms) could be a problem defending the run and might limit him to a role as a specialist rusher. His pro-day marks were nothing special — 4.95 forty, 1.69 10-yard split, 4.64 short shuttle. High character. Could be a Clinton McDonald type. Likely range: A team like Atlanta could show serious interest at #26. It’s also possible he lasts into round two. Former 5-star big-time recruit. Neither Brown or Quin Blanding lived up to the billing at Virginia. Was that down to them or circumstance? It wasn’t for a lack of effort though. Brown gives everything on the field. He had a terrific Senior Bowl and really looked the part. Super quick short shuttle (4.48) for a 6-3, 296lbs lineman. An underrated player with a lot of potential. A possible Michael Bennett replacement. Likely range: I think he’ll go a lot earlier than expected. Possibly rounds 2-3. Watching a Speaks highlight video feels like you’re watching a first rounder. His mobility and quickness working the edge at 6-3 and 287lbs is impressive. He rushes like a pure EDGE at times. Sadly the full game tape shows inconsistent play to go with the occasional flash. Even so, he ran a 1.65 10-yard split at his size and that can’t be ignored. Another possible Michael Bennett replacement. Likely range: Middle rounds — but the type that could end up turning into a valued starter. Hill looks like a Seahawks corner. He’s nearly 6-2 and 195lbs with that wiry, long frame they like (32 inch arms). His short shuttle (4.15) was very good — an important test at this position. There seems to be some concern about his maturity but it’s difficult to find specific examples of this. Didn’t have a great combine in terms of the drills but it was a lousy CB session overall. I like him and he played well against Oklahoma State’s James Washington. The Seahawks often take a day three corner to develop and Hill could be the guy. Likely range: Fourth or fifth round. Ideal for Seattle. There’s a ton to like about Oliver. He’s good in press, he’s 6-2 and 201lbs and he has fantastic length (33.5 inch arms). He’ll cover a huge radius and will be able to compete with bigger receivers. At his pro-day he ran a 4.00 short shuttle which is outstanding. He looks and plays like a Seahawks corner. But how early are you willing to take a corner? Because he will not last long due to his testing numbers and size. He’s going to be an early pick. Likely range: A few weeks ago the third round felt likely. Now? First or second. AKA one of the guys who instigated Baker Mayfield’s infamous ‘gesture’ during the Oklahoma vs Kansas game. Shaking the cage didn’t have the impact they hoped for that day. This was a curious workout and perhaps hints at the lack of pass rush options in this draft. Armstrong ran a 4.87 forty at the combine despite weighing 257lbs. He then ran a 4.88 at his pro-day. So he’s not especially quick (1.69 10-yard split). He is a natural pass rusher though. Likely range: It’s difficult to say. A drop in production last year and a mediocre combine could push him into day three. Former four-star recruit who chose FSU over Alabama and Florida. Major explosive traits. He managed a near 40 inch vertical plus a 10-2 broad jump. He’s 6-3 and 246lbs with great length (34.5 inch arms). In terms of a physical prospect he’s one to watch. He’s had concussions and this will limit his stock. The Seahawks need young depth at linebacker and could see Pugh as a priority free agent. Ford wasn’t invited to the combine and that seemed to tick him off. He’s only 5-11 but that’s not as much of a problem when you have 33.5 inch arms. He’ll win a lot of leverage battles at that height and unusually, for a shorter DT he’ll be able to extend and keep blockers off his frame. He might be a diamond in the rough as a pass rusher. Ford has a tremendous motor and plays with great effort. It’s a weird year at the tight end position. It doesn’t look like a horrendous class by any stretch. It’s just not particularly exciting. And for a lot of the bigger names, Goedert included, it’s difficult to work out where they should go. He performed well at his pro-day — jumping a 35 inch vertical and a 10-1 broad. He also had an eye-catching 4.06 short shuttle and a 6.87 three cone at 6-5 and 256lbs. The Seahawks are very likely to be in the market for a young tight end. Likely range: It’s so hard to say. Some think late first. There was a time when it looked like no tight ends would be drafted in the first two rounds, though. If the Seahawks want to draft the complete opposite of Malik McDowell they might turn to Christian Kirk. Zero character issues, ideal attitude, consistent college performer. If they just want a good football player with minimal bust potential, Kirk’s the man. He’s a downfield dynamo and a good fit for an Air Coryell-type offense. He uncovers well in the scramble drill and he’s a special teams force as a returner. Solid but unspectacular testing numbers. Likely range: He’s trending upwards and could be a late first or early second round pick. Tony Pauline said in our conversation this week that Ballage looks like Tarzan and plays like Jane. Ballage promised a lot at Arizona State and was unable to deliver. That said, Tony also told us he’d heard Ballage’s pro-day performance was one of the best his sources had ever seen. He can run with toughness and he’s an excellent threat in the passing game. Is he ever going to be more than a compliment though? Ballage fits Seattle’s prototype at the position (size, explosive traits) perfectly. And now the other shoe drops, Dez cut by Dallas. The other other shoe might be a trade for ET. Feels like that’s the way we’re heading. Plus a number of the players on this list are R2 types. They might have three R2’s by the start of day two. Option #1 for me but either would be awesome. Both good options but I think i would like #1 as well. I’ll have the #2 with a side of Shaq Griffin, Holton Hill, Martez Carter, and Poona Ford, please. And for dessert, Ryan Izzo in place of Goedert. So excited for the draft in less than 2 weeks! Still pretty bummed that in all likelihood we will not be able to sit and draft best available player at 18, I have a feeling a blue chip player or two will slide to us. Oh well, we made our bed and now we have to sleep in it. I feel like a kid at Christmas when the draft comes. I wake up Thursday morning all bubbly ready to go. To bad though at Christmas you wake up and open presents, here we have to wait until 5pm. Then the Seahawks may not even pick. Either way we have 13 days to go and cant wait. Agreed lol. I have watched the draft for as long as I can remember. Before Walt Jones, Springs, Ahman Green, etc. The first round was always so exciting. I still love it, but I sit there all evening knowing we won’t even pick. I miss the 2 day format. If not RB Chubb with our first pick. I want Ballage round 4. Stephen Morris signed for one year $550k, zero guaranteed. Most likely just a roster body to compete. Oh and the seahawks were at his pro day and he said he met/spoke to Pete carrol. Ha! At the pro day he was talking about being in the Minnesota snow training a little rocky 4 style. Rob, all team needs aside, what is your guess as to how the Seahawks view Tim Settle? I seem to remember both you & V12 believing he’s not a guy they would probably draft. To my eye I thought he looked like a potentially great interior rusher. Just curious how you think they would assess in him. add a big leg kicker to the roster! seemed like a no brainer when they brought him in. It’s odd to not spend as much time on defensive backs partially due to the class this year as we did last year. I wonder if now Seattle goes for cb early with Oliver. to me he looks like a guy that could really dial in opposite of griffin. I’m still a big believer in holton hill. Ive aren’t he vaguest of issues involving pot but nothing definitive enough to explain a team suspension from games but not all activities. Obviously poona ford….that dude is alllllll kinds of football. Hopefully ballage is a smoke screen for jaylen samuels. Very similar profiles but Samuels brings more for me to the table. Samuels is not a feature runner. Kalen ballage: 2016 stats….comparable year. 126 carries 536 yards 14(!) Tds. 44 rec. 459 yards 1. Td. Ballage has 4.4 yards a carry On his career. On his three ‘good’ seasons he didn’t sniff 700 yards rushing on any season. 6 tds per season and thats with him having a 7 touchdown game to totally skew the numbers. and as a “weapon,” only one time did he crack 100 yards receiving. I feel like a 76ers fan when I say “trust the process.” Because ballage isn’t some slept on talent waiting to realized. He plays in the same conference as ronald jones against the same teams and just hasn’t really done much with his chances. Totally different players man. Gonna have way different roles at the next level. Funny! But we can give ourselves a little bit of break, it’s not as easy guessing WHO we’ll pick when we’re never sure WHERE we’ll pick…. Maybe we can narrow it down. I think your first four guys *should* be gone by 18. There, we’ve just shortened the list. We’re doing great! 4.80/40, 1.68/10-yd, 2.80/20-yd all HH. 31-reps. –At combine, would have been #1 as LB, Tied for #1 as Edge (with Kyle Fitts), #2 = 27. Career: 48-games, 220-tkls, 123-solo, 45.5-TFL, 26.0-sacks, 3-PD, 4-FR, 8-FF. I like how that guy plays. He’s got some fun tape to watch. Ton of DL on the list. Players projected in every round and UDFA. Its clear we are interested in a type-rangy edge, inside/outside DL, penetrating 3T- but who? Tricky stuff JS. Basically it’s the exact opposite of how they’re visiting and w/o the RB’s. Makes me think they know which RB(s) they want. Interview well done. I saw smiling as I was listening to that. Such a classic Rob interview total focus on packing as much quality content as possible in a short amount of time. Total focus on the meat and potatoes questions an absolutely no non-sense or wasted time whatsoever. A SDB listeners dream IMO. Please keep doing your own podcasts/hangouts/interviews. Much rather see you driving the car rather than being a guest passenger. Not much rhyme or reason to the order other than draftable grades and a basic ranking on where I think they’ll go. The day 3 picks are a crap shoot for the round as we all know. Flowers, Bawden, and Samuels are excellent FBs and should all be good starters for different teams. Very unique players, each. Terrible WR class. Last year’s wasn’t exciting, but this years class just completely lacks star power to the point where you have to look at guys like Jmon Moore who had an awful combine, is a bad interview, and had horrible horrible drops. Gesicki is a bit of a paper tiger and I’m hearing that a lot of teams like Hurst as the only first rounder at TE. It only takes one team, but I believe Gesicki will be first TE off the board in the second, starting a run on those first few guys. There will be talent available later no need to overdraft. Thin class at OL all around. Very middle heavy draft for OL. Ragnow is incredibly underrated. This is group will have great value in the early third. I haven’t gone very deep in the DL class, but as always… If you want a pass rusher, you gotta take em early. Josh Sweat is gonna be the best value you’ll find at the position. I’m not leaving this draft without Quem if I’m Seattle. He’s heart, he’s speed, he’s all-football, and who could overlook this reunion’s chance to ignite the new era of LOB with actual loving brothers? It’s actually a really good Seahawks draft at corner. Isaiah Oliver is an option early, but we have plenty of potential cbs throughout. I think it’s quite a mediocre safety class. There are some very overrated players. I’m absolutely terrified at the prospect of losing Kam and Earl both so. Kind of totally unprepared for this draft for the first time in quite a while. We’ve never been in a position where we were basically 60/40 losing our best player 2 weeks before the draft. How do you replace Earl with the second round pick you recoup from him. You got Dante Pettis on your list. I’m starting to come around on him. The question I ask myself is can he return punts? I need to do some scouting, I got this guys! Yep, Dante can return Punt’s alright! Goes back to catch punts and can catch football’s in the Air. His goal with position of the ball is to score touchdowns. I’m so good at scouting I believe? Just as a means to gauge who might be available at certain points. First round picks ranging from 18-32. Obviously some of those guy won’t be available at the end of the first, this takes into account trading down. I’ll try to post a seahawks board closer to the draft. Like I said there’s just more uncertainty for me with this draft than many others. Great list Kenny thanks for sharing! Oops you somehow forgot Dante Pettis on this other list! Isn’t UW your second favourite team after the Oregon Ducks? It’s cool Kenny, not everyone can be perfect like Robbie. I like this lay out. The safety class is terrible. I can barely muster enthusiasm for Jessie Bates not because hes bad just that I think he’ll go in the second. Terrible value for a team with limited picks. the wide receiver class may be the least interesting in a few years. Calvin ridley ? Really he’s the best in the class. I suppose so if the talking hairdos say so it must be true. Chark in the second round seems legit. I think he’s a fourth rounder with a normal aggregate of talent but again this year he’s tall and fast and that’s gonna do it. Super into Kirk and moore. and raised an eyebrow to st. Brown as a highly ranked as that. Pauline keeps pushing him down pretty far. Look at those names…woof….from st. Brown to jmon moore. Are any of those guys going to improve seattle? Maybe Carrington in a sort of hybrid kearse role. Maybe trequan smith if you want to run a bunch of go routes? Walter has him as a potential first! I think late third was a pretty harsh prediction. St. Brown is listed as a potential 2-3rd rounder on Walter football. Maybe in Their drafts they are putting him earlier but not in his rankings. He’s ranked as the 6 th wr. and Tony Pauline has him listed as a 5th rounder. He’s got 23 wr listed above him. Meant to say after st. Brown it feels like scrap shoot. Which I whole heartedly disagree with. None of this will matter I fully expect a running stuffing d tackle first and for the passing game a lawler esque kind of guy…….that we can all talk about how he just needs some time to develop. I mean the fun of all of this is your and I being sure obi is the pick last year only to figure out who pocic is. You and I have a lot of the same ranges for players thanks to your exhaustive list but Seattle has a very unique system and what we, this blog, is honing into and what they are honing into seem to be pretty different. I would think dj moore Kirk and at Brown would all be 2nd rounders with this regime but for all I know moore and st Brown don’t even rate…. Also, there is Austin Allen and Kyle Allen, both AB. You don’t, he’s irreplaceable. If the trade happens it’s with the understanding that they’ll get a little bit worse as a team in the near term in exchange for some cap space and a couple of “prospects.” In that sense it would be similar to all those July 31 trades in baseball. Or they’ll get worse at free safety but better at a couple of other positions perhaps (plus younger and cheaper with a new culture). I’m hoping (expecting) that Earl has been a luxury item, not a necessity, for Pete to build his defense. Plenty of other teams can function well w/o Earl, so we should be able to as well. In fact, I’d argue that having your defense *require* a player like Earl is extremely risky. We’ve all seen the results when Thomas has been hurt in the past. Better to build a solid/sound defense that isn’t reliant upon a HOF free safety. Well, sure, they also function without the one or two draftees that would replace him. Not sure of the point here. Brandon’s point is, the vast majority of NFL defenses succeed without an elite free safety. Which is fair. They do function with other players, the type presumably Seattle would draft or add. If that’s the point it’s a completely trivial one. Yes, teams will function with or without any player that you can name. What does that even mean? Look, I started by answering a simple question as straightforwardly as I could. I didn’t use a lot of emotional language and I didn’t express opposition to trading Thomas, but to me it seems pretty obvious that trading him entails a real risk of getting worse in the near term. Maybe they will and maybe they won’t. But even suggesting it as a possibility seems to have triggered a harsh response. You do great work scouting all these prospects and presenting the information to the public, but I don’t want to be argumentative for it’s own sake, and if making this simple point is going to cause such problems I’ll just bow out. It’s not trivial at all. It’s a mere counter to what you said. Don’t think I’ve been harsh at all personally. Merely debating. Younger and cheaper for sure. Better at a couple of positions is possible, but you’re trading a sure thing for a couple of maybes. “New culture,” you have absolutely no idea how that’s going to work out, I can think of a few recent high ‘Hawk picks who got into knockdown-dragouts in practice, never even made it as far as training camp, and so on. There’s nothing wrong with trading a vet star for a couple of draft picks, but I think we should see the risk that’s being taken with clear eyes. A sure thing they don’t want to pay as a 30-year-old and might believe/know his best football is in the past. And if he’s leaving in a year anyway, getting something now makes sense. I never claimed to know how the new culture would go, merely implied that’s what they’re shooting for. My eyes are perfectly clear. I haven’t offered an opinion on whether it’d be right or wrong to trade Earl. Not in a piece or in a comment. Look, I know there’s an emotional attachment to Earl. I feel that too. But this team is changing. There’s no point pretending it isn’t happening. Well, I got into this thread simply to answer the question, how do you replace Earl Thomas? And the answer is, you can’t, he’s one of a kind, one of the best to ever play the position. If you trade him it’s basically a 100% certainty that you’ll be worse at that position for a while. I don’t think that’s a particularly emotional observation, nor have I expressed opposition to a hypothetical trade. I’ve been following the Seahawks since the expansion team was announced decades ago and have grown very used to the endemic personnel turnover and hard decisions that the sport entails. I was just answering a question. Sure, you came to answer the question and the topic developed from there. And I stand by what I said earlier. They might get worse at FS and better at two other positions. This is a good class for defensive talent in round two and day three. I think that PC / JS have real interest in Shaqueem Griffin and I really thought he would be the pick in Rd #4 for Seattle. But with the NFL inviting him to the draft does that mean he is a lock to go on Day#2? I realize it is probably for TB ratings etc but I think the last thing they would want to do is invite a guy an have him sit there in the green room till Day #3. It will be interesting to see how it plays out. Only 2 Trades to keep things less complicated. #33 Josh Sweat (Edge/ FSU) the Hawks get killed on twitter for over drafting Sweat but he has as much upside as anyone in this draft and plays a premium position. There are just not many athletes like him on the planet and they take a shot at a potential game changer on defense. #64 Andrew Brown (DT / Virgina) Hawks add an ultra athletic penetrating DT who will be much more productive in the NFL. #81 Shaqueem Griffin (LB- UCF) The green room explodes as he joins his brother in Seattle. #116 Kallen Ballage (RB – Arizona) Not my facourite RB for sure but seems like a Hawks pick and who knows he certainly has the potential. #222 Khalil Hill (FB/ Mich) Hawks add a big bruising FB to help with the run game. This is my guess at what the Hawks might do. Not whom I would pick nessecarily. Also think they will add a smaller scar back like Ito Smith or Chase Edmunds late or as an UDFA. Trevor. You have Cleveland trading their 33rd and 64th pick for Seattle’s 18th pick. Who would Cleveland want to move up to 18? Not Trevor, but my guess: K. Miller, C. Williams…L. Jackson. It would be for an OT either Mcglinchey or Miller. They need one with Joe Thomas retiring and the options are pretty limited in this draft. I’d be surprised if the Browns don’t move back into the back half of the 1st round to get a LT. Only two worth having and they need to replace Thomas. With three 2nd rounds they have lots of ammo to move back up. With all the talk about fixing the running game and with the lack of any consistency (production and/or health) from our current group of RBs, do you think the Hawks would be good with not taking a premier / difference maker kind of back early and just taking a lower round or complimentary type of back later in the draft? Would that be sufficient to accomplish their stated objective of fixing the running game? Sincere question. Is our run game fixed if it requires a special guy to run it? What’s really wrong if we’re relying on a rookie to bring the culture back? Telling people with a straight face that you have a second round grade on Carson like you won a prize getting an oft injured back in the 7th round. Just say you are stoked and move on. He’s a good get you don’t need to church it up for fans. Picking a fair to average wr with one year of running back experience to be your running back . so minimal vetting via game tape. A pull a name out of a hat style o line and being good with that. Not using a full back. Hoping for the deep shot on first through third down. What’s going on for me is trying to be the smartest guys in the room and watching it not work. Hey just like oakland and moneyball. Sometimes you just need good players whom have proven to be good to get results. Lynch wasn’t a fluke. He was good in college, good until buffalo tired of him and good in seattle. It’s not a real mystery. Good post, Peter, and I’ll be really disappointed if one of our two top picks isn’t one of the top 3 rated (after Barkley) RBs, Rojo/Chubb/Johnson. It’s actually a prestigious list even if it doesn’t contain a bunch of your favorite players. The defensive players alone you would hope with then open holes rather many as two could contribute from the first game forward.. I really like the thought you put into this, and I could definitely see each of those guys as possible/likely Seahawks picks. My only real quibbles would be that (a) other than adding Dissly, it doesn’t seem to help the running game at all, which is something PC said he wanted to do. And (b) something just nettles me about the idea of Kirk (or any draft WR) that high. Just don’t see it as the need that others do, I think, or I want us to move away from type, whatever. Maybe swap the best avail. RB at 50 (Kerryon Johnson?) and take the WR at 116 (Traquan Smith?) and I’d be happier. But that’s just me. We did sign several FA DTs. I think Leo is one position you should never take for granted because of how distinct our parameters for the position can be. If there’s a guy that you can work with, you can never draft enough pass rushers. I think we’ll go after a guy like Breeland Speaks to replace MB this year though. Kenny. I get the feeling that Breeland Speaks is this year’s Malik McDowell. Breeland Speaks has never really flashed on the same level that McDowell did. A bunch of their visits and interviews have been with DL. If they were not considering taking one why waste all that time and the visits etc. We are losing Bennett and Avril and have only signed two Veteran DT to one year deals. There is a huge need for both Edge rusher and pass rushing DT IMO to replace Bennett and Avril. The need is even greater if McDowell can’t play. It’s really hard to predict a draft class a year in advance. Agreed that it looks awesome now, but a lot changes in a year. Guys come out of nowhere, guys disappoint, injuries happen. Plus its impossible to have too many edge rushers. I don’t think Kirk is there at 50. I say take Kirk at 33 and then you likely have your pick of Jones/Chubb/Johnson at 50. Inject some new life into the offense, then go to defense with next two. I’m starting to convince myself Seattle will take a pass catcher early, maybe with their first pick, and if they end up having multiple day two picks (3 or more), WR and TE could both be early targets. I was drawing up a mock draft last night that included an Earl trade to Dallas and Seattle trade with Cleveland, and a move up into round three. Seattle drafting, Kirk, Goedert, Turay, and Ballage. I definitely feel like pass rusher will be a desired target early, Sweat and Turay feel likely. I’m kinda favoring Turay at this stage. I keep going back to that Washington v Rutgers game and remembering how much Turay was flustering Jake Browning. Washington was in danger of losing that game. Turay had major impact. Except Dante Pettis of course, I know you don’t want the GM’s who read this Blog (which GM’s don’t) to draft Dante but I believe that some things are fate and I’m not scared that he won’t become a Hawk! Beginning to like the idea of taking Kirk early on but only if we have multiple picks in the second round. Great hedge for Lockett with his special teams ability and potentially more upside as a receiver. I don’t know why, but I have this weird feeling he is their guy. OTOH, I’m usually wrong. Also we’ve seen JS/PC like to choose for needs a year in advance. Kirk would be insurance against Lockett leaving after next year. Importantly, he sees the end of the 1st round talent in the mid 20s, making pick 18 more valuable than I anticipated (if correct). don’t like the “may or may not be,” …..line. Just say it or don’t bring it up. It’s just a corny way to incite engagement while avoiding any thing resembling journalism and most importantly not staying something that is potentially libelous. I believe every living Human Being has a right to their beliefs and feelings. So I accept the fact that you don’t like the “Do or Do not know” expression. I don’t get the deal though I like your posts Peter. Thy hawk! I have no problem with unshakeable bringing up lances tweet. Not at all. My problem is solely with the part of lance zerleins tweet…..ominous music playing in the background….. “There may or may not be chatter about jones but I’M not going to get into it……”. but by making that tweet he is actually getting into it. He’s making people feel that there something up with jones and that it isn’t good. Because positive chatter would be said what it was….. It just bums me out that people that are influencers choose to operate this way. One of the things in love about this blog is people have no problem swingman they like and why they like them. It’s refreshing from sports journalism that is often a or of inuendo. IMO there’s only a few DL in this class who even come close to the 2019 options. Of those guys I can really only see us spending an early 2nd on Settle. Unless someone drops. Does Schotty run lots of Air Coryell and is he bringing it with him? Like I wonder if we’ll use a number system for receivers. It’s a great question because he’s never had a qb worth a crap so it remains a bit of a mystery what he’ll do. going to be strange to run a vertical offense with a tactician and a slowed down deep threat as the only weapons. I have to think someone like st. Brown is in play. But every year because once a hundred years ago pc had big Mike Williams fans, including me, think this is the year where they really mean it and get some size at wr. Good point Kenny I think the change in OC adds a real unknown into the offense and may be a reason why they have been checking out some of the smaller RB like Ito smith and Edmunds as well. I kind of like the Air Coryell scheme and Russ seems like a good QB to run it. I personally really hope they utilize the screen game a lot more this year to help slow down the pass rush. Carson, Prosise are already good pass catchers out of the backfield and I have a feeling any rookies they add could be strong in this area as well. I think the lack of a screen game the last couple of years really hurt and let defenses just pin their ears back. Did a 7 round mock with Tony Pauline’s board. Making a trade down Cleveland and Earl to Dallas. (2018 #50+ 2019 conditional 2-4 round). Love the picks if you can get them in that range. How about another Seminole, Ryan Izzo, at 226 or 248 instead of Schultz at 120? What options would that open up at 120? Actually, Zierlein has him in rd 5-6, so maybe slot him where Teller is (since you said you weren’t sold on him) and maybe there’s a better OL at 120? If they go with Kirk—he’ll project as a slot for us right? Would that then mean Dougie B plays X Receiver primarily? Kirk is exactly the type of player I want the seahawks to pick. Smart-Tough-Reliable. I actually hope Dez goes to Houston, Him and Hopkins on the outside with Fuller doing his thing… They’d be scary, and they already are very scary. Does it feel like this could be the year the Hawks explore drafting a CB earlier than they ever have before? I know they have a set of standards they look for physically & I believe last season was the earliest they drafted a CB (Shaq in the 3rd) but it sure seems like they’ve been linked to some CB’s (Isaiah Oliver) that you’d have to draft earlier than later. Obviously this would be contingent on getting more picks but I’m coming around to the idea that the Hawks would have two talented, young, potential lock down corners on the outside for a long time. That would allow them to focus on other areas of needs over the up coming years draft & free agency wise. We’ll see. It’s still very, very unlikely. If they have three second rounders and Isaiah Oliver is there, maybe they do pull the trigger. But Holton Hill looks like the hedge. If Oliver goes R1 then not convinced they just move to Carlton Davis. How do we know they haven’t wanted to go CB in the 1st or whatever before this year? Could be a case of victim of circumstance. I still believe in my heart of hearts that Bradley Roby was their guy in ’14. Last year would have been a year to do it too. Before trading back the fist time they had a chance at Tre’Davious White then before trading back again could have had Kevin King. Still not convinced Earl will be traded. But it would be Jerry Jones move to make a splash in the limelight. We really don’t have much of a choice, we either extend him, which we shouldn’t and likely won’t do, or trade him. Those are the 2 best case scenarios. The 2 worst case scenarios are he stays and holds out, or we cut him for no compensation. They can always franchise him for a year if they have to. But I’d rather get good compensation for him if they aren’t going to do another contract. That is one hell of an endorsement of the player there. Question for the forum: what has changed between last year and this that makes Colin Kapernick (sp) a viable option? Money? Last year PC said that Kap was a starting QB in the league. What that a reference to how much Kap wanted to get paid? Or that Kap wanted to start? If the latter, why even consider Seattle, given the presence of RW? Sure, the workout/meeting was postponed, pending Kap coming back with a plan, but why invite him to Seattle in the first place? What has changed? The Seahawks will trade back with Cleveland, Cleveland will draft a left tackle at 18. 2nd-4th is loaded this year. At least for me it is. It’s pockets like every year. My thought is why would teams trade those 2nd-3rd rounders then? Only for a player of Earl Thomas’s caliber I say. Something that struck me was how much work the Seahawks are putting into the front 7 of the defense on their pre draft visits. Specifically DL. Something else that I keep rolling around in my noodle is the ET trade possibility. Could it be possible that Seattle “might” have the #18 and #19 picks in the draft (after a trade) and actually use both picks at that position of #18 and #19? Which 2 players would be must have players, that you could not pass up on at that spot, if available. These 2 guys stand out to me… and seem like a very obvious short and long term fit. Will either of these guys be available… tough to call right now…. but if the LB is available, he seems like such an obvious pick for Seattle…. SPARQ’d up and very unique physical gifts. Davenport is also very unique and would bring alot to the table at the DE position. The loss of multiple players on the DL’s impact would also be negated. Not to mention, if you can get Clark on one side and Davenport on the other… not a bad 1/2 punch. I confess, it was tough finding a good value for offensive players at this spot, except for an OG (Wynn or Hernandez). The likelihood of a trade back for more value picks in the 2nd or 3rd round would be very high in this scenario, but as I mentioned before… the BST LB is so unique, they might HAVE TO pull the trigger with one of the 2 picks (#18). Makes sense. There’s far more potential blue chippers on that side of the ball this year. Combine that with PC being a defensive mastermind and Seatttle losing most of their big time personnel on D, it’s now time to find the next core. Or you could go running back and wide receiver and get your choice of players. Either way you upgrade defense or offense. One advantage of going offense early is that the defensive picks seem deeper into all the rounds. 1-Stand pat and draft at both spots. 2-Draft at one and trade one down to accumulate more picks. 3-Trade both down to super-accumulate more picks. I think 2 & 3 are the most plausible scenarios. I’d take #3 in a heartbeat if they can walk away with 2 second rounders and 2 3rd rounders. But if they stood pat and drafted at 18 & 19 I think there’d be some great options. A player on each side of the ball would be a great way to infuse some talent into the roster. Personally I’d advocate for a skill player on offense rather than an OL. Are there any skill players worth taking there though? That seems like the sweet spot to get your OL of choice. Or a front 7 player. This is purely personal preference but I would take Isaiah Wynn at one of those then trade down for 33 and 64 with the other. Pick up Chubb or Michel and a pass catcher like Chark, Pettis or Michael Gallup. My hunch is that Seattle would not go WR in the first round, but could take one in the 2nd round. This could be where Kirk fits in or another WR similar or a clone of Golden Tate. I keep hearing words such as “unique” and “exceptional athlete” with regard to Davenport. Why do people keep saying that? He seems like a fine athlete and a good prospect, but I can’t see anything particularly unique or exceptional in his athleticism. For example, I think Turay or Aruna or one of those “project” guys tested as a better athlete. I guess I’m just missing it with this guy, or he’s getting pushed up because of the lack of good DE prospects. It will disappointing if we don’t get a starting RB. We have too many needs this year but RB should be highest priority. I’m worried JS/PC don’t get too cute and risk it. Dontae Johnson’s contract is one year $1.3 million. Marcus Smith played through a torn ligament in his foot last year? And still looked pretty good. I’m not worried about DL if I’m PCJS. A Tyquan Lewis or Settle if hes there would be nice, and they’ll likely add 1 guy day 3, but I think we’re pretty set. We could use a DT who can actually look push the pocket (I think Reed develops into this this year) and a DE. But I’m honestly comfortable with what we’ve got. Next year we could go DL with both of our top picks and make our line so nasty. Or Settle this year and one of the DEs next year and we wouldn’t miss Bennett, Avril or Richardson a bit. Tim Settle this year and Joe Jackson from Miami next year would be excellent additions to Clark, Jordan, Smith, Reed and Jones. Heres my mock draft. I believe this is best case scenario for the Hawks. If the Seahawks managed this it would be an amazing job by Schneider and the rest of the team. Although turning the #18 first round pick into 2nds and a third is a lot it is reasonable. I believe this draft is very realistic because all of these players have met with or been interviewed by the Seahawks. I believe there is a very high chance we will see Christian Kirk Kallen Ballage and SHaquem Griffin become Seahawks on draft night. There is a very obvious want for Shaquem Griffin and Kallaen Ballage and Christian kirk were invited to. private workout by the Hawks. I also really like Ronnie Harrison he is extremely raw but with proper coaching I see him becoming a very Landon Collins Jamal Adams like player. Also I believe Ito Smith in the 7th is possibly a HUGE steal. He could very easily not become anything but his ceiling is so amazingly high its worth a seventh rounder. It’d be great to get Austin Corbett in round five — but he’s going to go firmly in the top-45.